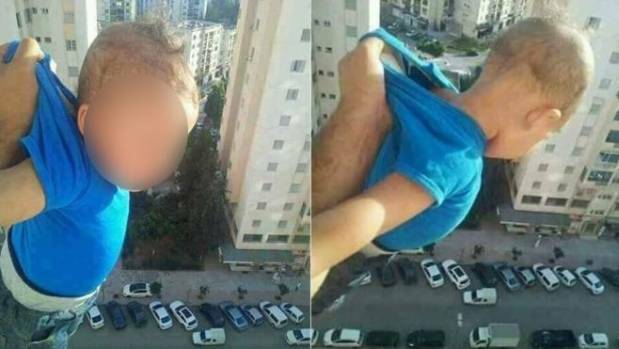 In a strange and shocking incident, a father dangled his baby out of the window of a 15th-floor apartment in order to gain Facebook likes. The man, from Algeria, has now been sentenced to two years in prison. He had posted pictures of the child being dangled out of the window, with a single hand gripping the back of his t-shirt 150 feet above the street. He captioned the Facebook post as, “1,000 likes or I will drop him.” The man was reported to the authorities after Facebook users saw this post. He was arrested on the charges of putting the life of the baby in danger. Therefore, yesterday, an Algerian court in the capital Algiers sentenced the man to two years in prison. However, the man claimed that the picture was photoshopped by the users. According to him, the balcony had protective bars which were removed by Facebook users as the pictures had been altered.